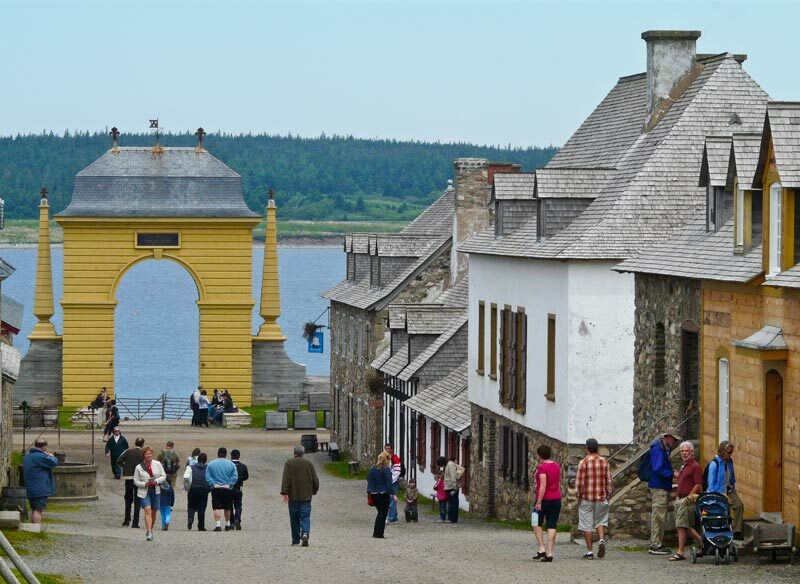 Louisbourg is just a half hour away from Sydney, our Canada Day headquarters, and Fortress of Louisbourg is North America's largest reconstructed 18th century town (that's right, bigger than Williamsburg). What better place to start our celebration of Canada Day? 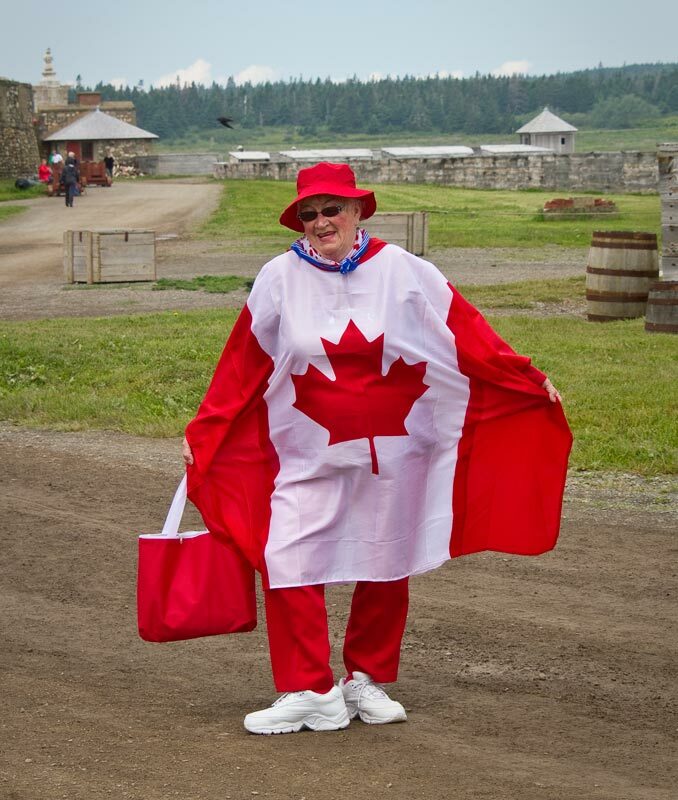 Even better—the Fortress is celebrating by offering free admission today, saving us $35! We stop for breakfast in the only restaurant open in Louisbourg (pop. 1,265), and everyone there is talking about the free day at the fort. The restaurant owners are closing up shop at 1 to go there, the husband of the woman at the table behind us is working the gate at the fort and told her he is really busy when she tried to call him on the phone. She isn't sure her other friends who usually meet her for breakfast will show up, because they are planning to go to the fort. 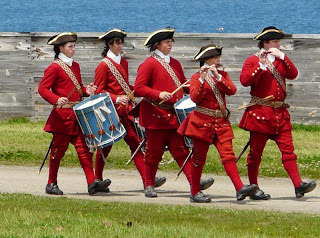 They do show up, but only for a quick coffee, because they plan to eat at the fort. The fortress is a big deal here. In the 1960s it was in ruins, and the town was going in the same direction, as local coal mines closed down and unemployment rose. A legislator had the idea of rebuilding the fort "to help revitalize a Cape Breton society suffering from massive unemployment and social malaise." 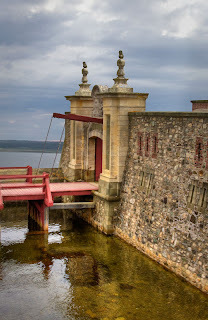 The project took 20 years, involved retraining miners to do all sorts of building trades as practiced in 1744, and employed a huge number of archaeologists, researchers, architects, and others in the process. It is an ongoing project—only about a quarter of the original town has been reconstructed, and there are active archaeological sites at its periphery. The exhibit about the reconstruction is almost as interesting as the experience of stepping back in time and enjoying the results of the massive reconstruction effort. 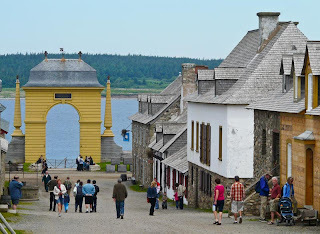 As we cross the drawbridge over the moat and are interrogated by a military guard at the town gate, we are immediately immersed in life in the walled Fortress of Louisbourg in the year 1744, when 2,000 French people lived here. Civilians stroll the city and go about their business, while soldiers drill within secure areas that are off limits to commoners. 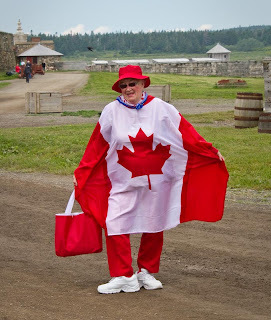 We join a walking tour led by a Parks Canada guide, then are on our own to explore the town which is full of costumed interpreters who are happy to talk about their life and work. We are particularly impressed by the many costumed children, who stroll about with their families, observe the military pageantry, and play games and dance. They encourage visiting children to join in their activities, and never tire of posing for pictures. We have lunch at one of the local dining halls, where the costumed server issues us our cloth diaper-size napkins and spoons, and tells us to tie the napkins around our necks, like the soldiers do so we won't mess up our clothes. She advises us that our spoon will be our only utensil. We have already learned that the water here is not particularly sanitary in 1744, so I order the hot mulled rum, which is what the soldiers would drink, the waitress assures me. It comes in a pewter cup, which is a welcome hand warmer on this 57 degree day with a cold wind blowing in off the water. I should note that the natives are wearing tee shirts and flip flops today, while we are dressed in layers. After lunch, we stop in the bakery and learn about how the bakers make fires to heat their brick ovens white hot, then remove the fire and cool the hearth to 475 degrees, the perfect temperature to bake hundreds of loaves of dense heavy (six pounds per loaf!) bread each day (we had some at lunch, and pass on a purchase). We watch a bobbin lace maker manipulate fifty bobbins to make what she calls a simple beginner's lace. It takes her 1 ½ to 2 hours to make one inch of lace. All the lace on costumes worn here is made here. We watch military maneuvers and tour the spartan military barracks. We tour the governor's elegantly appointed mansion, and the two room sod roofed cottage of a fisherman. A shepherd runs a herd of sheep down the street to their pen. Time flies by, and our little visit turns out to be an all-day affair. 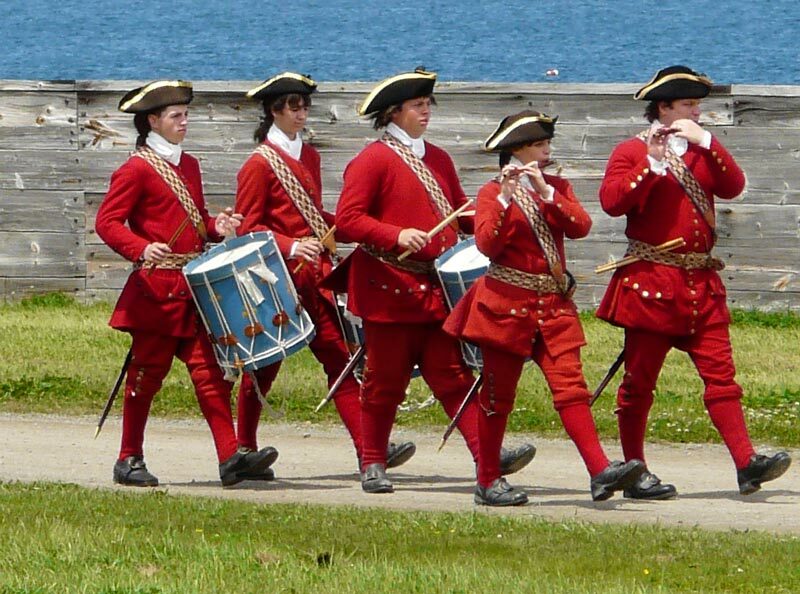 After all that wandering around, we are ready for another Louisbourg Canada Day activity—the Strawberry Festival at the Senior Center. We buy our tickets and are each handed a big bowl of Nova Scotia grown strawberries. 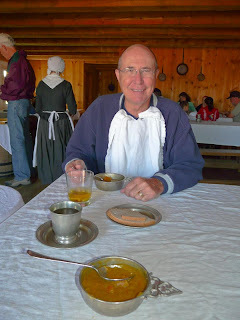 We sit down at a long table that has plates of home made biscuits, cream and sugar that we can use to embellish our strawberries any way we like. There are also plates full of home made cookies, brownies, bars and cupcakes, as if the strawberries are not enough. We sample lavishly. As we are leaving, one of the ladies organizing the event says to us, "Did you get a bellyful?" Of course, that is the objective of the event, and if we had said no, I am sure she would have sat us down and given us another bowl of berries. As it turns out, the berry feast is our dinner—we need nothing more to eat tonight. By the time we get back to Sydney, it is raining once again. We get out of the car just long enough to take a photo of Sydney's Big Fiddle—17 meters and 8 tons big. 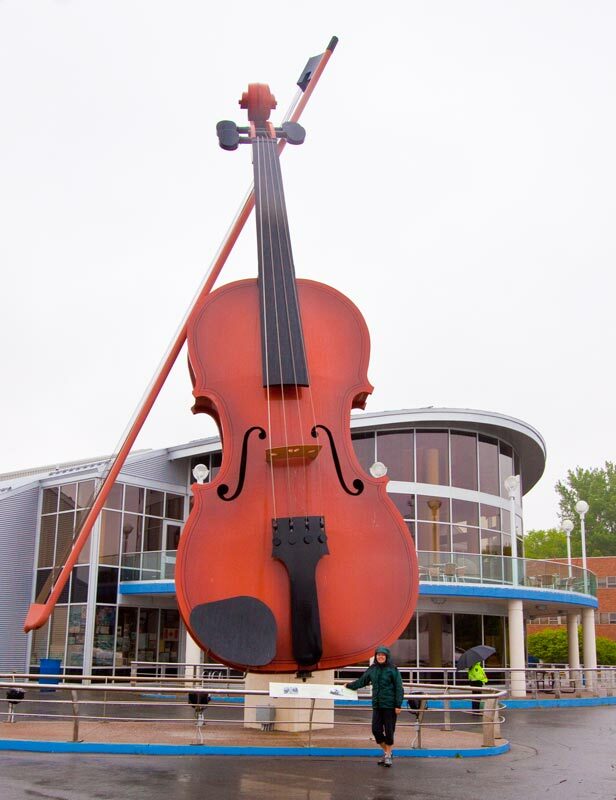 We can hear the music from the Canada Day celebrations taking place just a few blocks down the waterfront promenade, but we have celebrated enough for one day, and prefer to be dry and warm.